“Why VOMO?” – You ask? Because you want to be successful. With VOMO all your other expensive recording gear will suddenly make sense. Why is that? Because for all that gear to record a nice sound you need to create a studio quality acoustic environment and that is exactly what VOMO delivers. “Got my VOMO and it’s changed everything! My auditions sound great again !! thanks! If you think about it: you want the best, most sensitive microphone to record all nuances of your voice, then you need a sophisticated software to remove all external noise and unwanted echo from your recording, and when you do that, you are inevitably removing all the nuances of your voice that you had bought that expensive microphone for in the first place! The trick to recording a great audio is great acoustics. Simple. Then you can record your audio and give it to your audio-engineer untreated, and he is going to LOVE you for that! Unfortunately, great acoustics are not simple to achieve. And this is what VOMO does – it delivers you that great, elusive acoustics that your sound engineer is looking for. Plus, it delivers it consistently, no matter where you are recording. So, WHAT does VOMO do for me? External noise is an air-conditioner, street traffic or a distant lawn mower. Reflected sound is the echo that is created inside your room the moment you make a sound. That reflected sound or reverberation, gets recorded by your sensitive microphone just a tad later than your direct sound and it messes up the whole thing! I am sure you know all that. So VOMO takes care of it for you. Even though it is not soundproof, and we recommend you to find the quietest place available, VOMO still cuts down about 7-10 dB of noise (How Sound Proof Is VOMO?). And this is nothing to sneeze at! But the greatest wonder is the VOMO’s ability to remove “Room Tone” and completely cancel any and all echo and reverberation in any environment. We’ve tested it in numerous and the most ridiculous places we could find and VOMO delivered great results consistently. You can check some unbelievable places we recorded audio samples in on our VOMO Tour around the USA. (VOMO Tour – Memorial Hall Video). For sound absorption we use Producer’s Choice acoustic blankets material. With NRC 0.8 (or 80% sound absorption). Design features a popup construction that makes the booth set up and use very easy and practical. The size was calculated to deliver maximum internal space with minimal “travel” size and the width just enough to go through an airport security scanner. All these seemingly unrelated features taken together deliver unbeatable acoustic performance. Here’s how: When you open the booth – it has enough internal space so the sound absorption material is not in the near proximity to the microphone; this is extremely important, because if you surround the mic too closely with absorption material, it tends to remove the high frequency sound, which results in an audio recording with severe high frequency depletion. The ability to adjust the microphone allows you to find that sweet spot that works for your voice. This is especially important for book narrators to create a believable character, and that may require the voice actor to be a little farther or closer to the microphone. You can also position the microphone slightly of axis so you do not speak right into it. And of course, this spacious interior of the portable vocal booth combined with the ability to adjust microphone position allows you to use your favorite mic, no matter how large or small. (Check our our Microphone Compatibility Page ). No other portable sound booth can do that. And finally, the Sound Isolation Hood covers the voice actor all around, blocking sound reflections coming from behind you. This is what really creates a studio quality sound anywhere. The hood is not a flimsy piece of fabric that sits on your head, no-no-no!, it is a thick Producer’s Choice material that is supported by specially designed rods, so it is not going to create a bad hair day for you! I thought you’d never ask! You can use it ANYWHERE! VOMO is designed to be a carry-on booth, so it can be taken in a plane as carry on luggage. We also include various accessories to make sure that you have everything you need right there, and concentrate on your work. VOMO can be used as a table model or it can be mounted on a microphone stand. You can use it in a car, and you can use it in a bar, you can use it here and there – you can use it ANYWHERE! “For YEARS I have been trying to find an inexpensive and portable solution to the perfect recording environment. When I stumbled across your portable recording booths, I thought THIS IS IT! This is the answer that I have been looking for this whole time! ” Charlette. Thank you Charlette, this is a new product and we already have customers writing songs about it! Yet nothing beats portability and acoustic consistency of VOMO when you travel. If you do lots of traveling and like to record on the road, while you travel, VOMO is your friend. It is always there for you when you need it. VOMO allows you to be mobile and still productive. 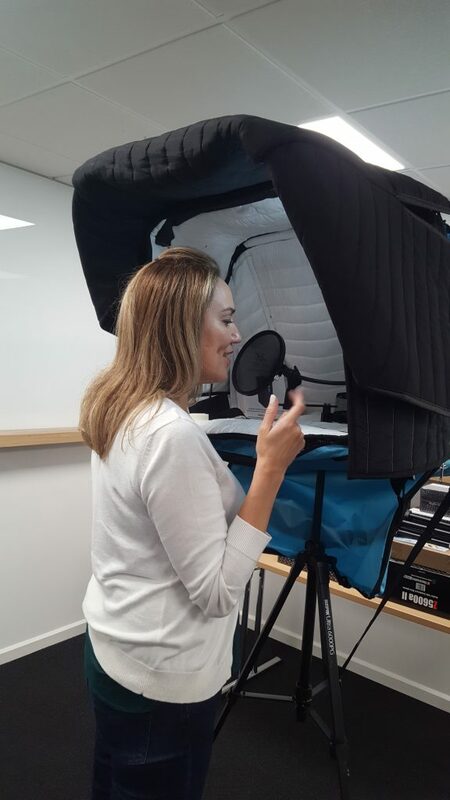 This is why it is VOMO – Voice Over MObile recording studio! VOMO is obliGATORy for all traveling pros! VOMO produces a reliable and consistent acoustic environment wherever you go. Now you can travel and still make yourself available to do recordings for your clients anywhere. Free yourself while keeping those important clients. We dare you – Take a vacation! This entry was posted in Acoustic Room Treatment, Articles. Bookmark the permalink.